"Engaging Youth in Ecology through Art and Nature"
I am at the MAEOE conference in Ocean City, MD (Maryland Association of Environmental and Outdoor Educators). It's great! I thought it would be useful to put my notes all in one place so here is what I took away from the first session I attended. It's a lot of notes because the session was three hours. The workshop was led by the Parks & People Foundation located in Baltimore MD. The presenter writes curriculum for after school programs that help expose children to environmental issues through Art and build their ecological literacy. The curriculum is called Project BLUE - Baltimore Lessons in Urban Ecosystems. One of the attendees is working on a project that I also thought was interesting so I wrote it down -- Brickyard Educational Farm in Montgomery County. It looks like a new initiative. I learned that the MSDE has issued 8 standards for Environmental Literacy, which I didn't know. This is helpful since I am currently writing a paper for one of my master's classes on the history of Environmental Education. The final standard is sustainability which is the big thrust of the presentation I'm going to be in on tomorrow. The Project BLUE curriculum gets to that big question slowly -- first, they teach kids to notice what's around them. Then, they begin to create backyard habitats. Finally, they become stewards. One of the icebreaker suggestions Desiree shared was new to me and would be fun in a summer camp or homeschool coop setting where people are meeting each other for the first time. She suggested having each person come up with a movement that goes with their name -- hand movement or whole body. You move around and introduce yourself to people and do the movement as you do so. Then the whole group comes together and reviews. The first person says their name and movement, the rest of the group says their name and does their movement. Then the second person introduces themselves and the group repeats and acts the first person's name then adds the second person's name. By the end you have made a group dance and the names have been repeated so often that it really helps people to learn them. Doing a movement with a name is a great help since you're learning kinesthetically as well. Now on to the content, some parts of which are more fully developed in my notes than others. Project BLUE curriculum. 6 modules. K-1 is in draft form right now, focuses on case studies, keep the scale small and relevant. I liked their big picture of how they divided up the arts. Designs in Nature lesson. Google searches of fractal images. Find someone in the classroom who has the same patterns as you. Frans Lanting. Decomposing leaf. Field microscopes x30. More expensive version hooks up to a laptop so you can put things up on the Smartboard. Meet a Tree: put students in partners. One is blindfolded, one can see. The leader takes his/her partner to a tree. That person has to use all their senses to learn about the tree. Have to find that tree later without blindfold (take them on a short walk and then return them to the approximate vicinity. Use this as an introductory lesson before teaching tree identification. A variation: make journals, do rubbings of tree bark with block beeswax crayons, make some notes about the tree, trade journals with a friend, can you find that tree? Do a tree bark rubbing to confirm. Tree "Cookies" - Buy from Nature Explore Sourcebook or use these directions to make your own. Workshop participants also suggested asking local Parks & Rec, checking the Forestry Yard, asking people who have fallen trees in their yard or tree service companies. Cut the ends of discarded Christmas trees (Desiree actually said that her mom would cut a slice off the bottom of the Christmas tree each year and keep it, having her write a memory on the tree cookie from that year). Examine the tree cookie, learn about what the rings can tell you, then pose a creative writing project - What might have happened in your tree's lifetime? What would its memories be? Assign students animal photos. Laminate for durability. Have them figure out who eats what? Pass the yellow ball of yarn around -- yellow represents the Sun, Energy -- makes a giant web. But she had an even better suggestion. A better fit with urban environments and older children is Urban Roosts: Where Birds Nest in the City , inspiring and informative to see how these animals survive and continue to make their homes in these most unlikely places. Desiree told us that Baltimore City has a new initiative called "The Power in Dirt" to help revitalize vacant lots into green spaces. Here is their Blog: Power in Dirt. From here Project BLUE gets children into creating or extending existing schoolyard habitats. Doing a winter nature walk to see if you can find anything for the birds to eat. Make and paint simple bird feeders or birdhouses (if you make a bird feeder or bird house from an empty paper milk carton put a layer of polyurethane on it before the acrylic paint, to help it stick better. Peanut butter mixed with Crisco slathered on pinecones and rolled in birdseed, gourd birdhouses, stringing dried cranberries to make garlands to decorate evergreen trees in Winter, etc. A butterfly garden. She suggested monarch butterflies or luna moths: Fly, Monarch! Fly! She highly recommended the Monarch Sister Schools program. Apparently they do teacher professional development with a small fee where they teach you to build your own butterfly habitat (for hatching them) and then provide you with larvae to get you started. You can also tag and track your monarchs. You can even start up a pen pal program with a sister school in Mexico! But it would be nice to have kids make their own. You could even make an act out the entire lifecycle in puppetry before raising your own Monarch Butterflies. I learned a lot during her presentation about Monarch butterfly migration. They migrate every other generation. Not every Monarch migrates to South America! If they are born here in MD they travel to Mexico, then come back to the Southeast -- like Florida -- mate and die. Those offspring come here to MD, mate here, and die. Those offspring go to Mexico. Which begs the obvious question, how do they know where to go??????. Migration is always amazing but these butterflies aren't even going to the place their parents went to. Desiree talked a lot about cultural connections to the monarch butterfly migration. They arrive in Mexico around the Day of the Dead (last few days in October, first few days in November). The souls travel on the backs of the butterflies. Therefore, the butterflies mark the return of their ancestors. Everything goes in a cycle. Death/Renewal. We should do more Art in connection with Day of the Dead in our school... The Monarch chrysalis is so beautiful, it could easily inspire an art project. If you're doing a garden that opens at night, hatching luna moths would be a great fit. Of course, this might work best for homeschoolers or people who can host a camping trip to their own school grounds where they could be there at night to enjoy the garden. Desiree said that luna moths are also in decline so it's good to raise awareness about them. They like oat, sweet gum, and hickory. Only about 20% survive in the wild to make it to adulthood. She notes that if you're making a cage of some kind to hatch your monarchs in it must have really hard screen at the top. They must hang upside down until their wings dry and if they lose their grip and fall they will die. A good book that I found on her resource table: Monarchs and More: An Inquiry and Arthropod Based Curriculum K-2. Also available in Grades 3-6 and Middle School. Mosaic Stepping Stones - have kids choose a pollinator to use in their stepping stone design for a butterfly or other types of garden. OR they can choose any Eastern Woodland or Chesapeake Bay (for our area) species because the garden helps to prevent runoff, thereby indirectly benefiting all of those animals. She went into a great amount of detail on the Stepping Stone process. She had the children first choose an animal (the color photos on the animal habitat cards are a good place to start). Then cut or tear construction paper pieces -- or paint chips -- to draft the mosaic design. Next, practice cutting and gluing tile pieces on a scrap piece of cardboard. Safety requirements: glove, dust mask, safety goggles. 4 inch tiles break the easiest. Use tile cutters or cover with a towel and hit with a hammer. Old dishes (Goodwill, etc). Ask for broken tiles from stores. Sea glass in different colors. She recommended this project with middle schoolers (7th grade and up) but I know people do it with younger but sometimes in a collaborative mural format. One attendee said that they did a group mosaic of rockfish in SAV (submerged aquatic vegetation) and taught all throughout, explained about small fry while the students worked. She said that they retained a lot of the content because they were exploring it in a hands-on way. The next step in making a tile mosaic is to give students a sturdy piece of corrugated cardboard that is the exact shape of your stepping stone form. The students can cut and place their tile pieces until they are 100% perfectly happy with their design. Then carefully put a piece of contact paper over the design and wrap the extra contact paper around the back side of the cardboard to protect and preserve it until your concrete is ready. You can either pour your own form and wait for it to set, leaving an inch or so of space for the last few steps. Or you can purchase a pre made concrete stepping stone. Either way, once you have a concrete poured and dried and ready to be decorated, she suggested a layer of Thin Set "Glass Tile" on top of the concrete. Then quickly lift the contact paper -- with tile pieces clinging to it -- off the cardboard and set it on the wet Thin Set. Thin Set comes in a variety of colors by the way, so ask the children what they want the background of their design to be. Let the thing set up overnight. Don't take off the contact paper until it has dried overnight. Then grout it. Grout dries fast as well so have a large industrial car wash sized sponge wet and ready to wipe your tiles down. If you choose to not use grout, make your layer of thin set twice as deep so that it can really grip those tile pieces. She also suggested a final brushing of polyurethane at the end to make it more durable for outdoor use, as well as glossy. This whole project took them two weeks, meeting twice a week after school for two hours each time. So that's 8 hours total. Also consider large group murals or outdoor signage this way. For a stepping stone, make it at least 4 to 6 inches deep so that it can really be buried in the ground and be stable. I wonder if you could make little ones by turning a cinderblock on its side and lining those holes with sturdy plastic trash bags, then pouring the concrete in there. Seems like a good deep form. I think the idea of putting contact paper on the tile pieces and lifting them and setting them directly in the cement is genius. She had one suggestion which immediately made me think of One Small Square: Backyard and One Small Square: Woods which was to use old PVC pipe to make a 1 foot by 1 foot square. Place in your schoolyard and calculate biodiversity. There's also a "species abundance" formula you can use from there. She got onto this topic while thinking about the paint chips for the tile mosaic project. When they do the diversity within the square, she takes out as many brown and green paint chips as she can get from the hardware store to help children be more specific about what they see. It's not just everything is "green" and "brown." Students can say "asparagus" "dill pickle" "geranium leaf" "pesto" "grassy field" or "vineyard" when describing their greens. Runoff - she explained this in a very kid-friendly way that I had never thought of before. "Gravity is part of Earth's essential movement." Gravity pulls water downhill. Which here means it runs into the Bay. Last few notes: Community Art. Combines environmental awareness and community outreach. She talked also about doing a storm drain survey of the schoolyard, where are puddles farming, what is the elevation of your school, using a topo map, create a runoff model in a paint tray with clay, include impervious surfaces and streets. Tilt it. Sprinkle KoolAid powder in places where there are pollution. Then spritz with water or pour water in it to simulate rain and watch where the water goes. I think the KoolAid idea is particularly good because it will dye the water and be very obvious where it has gone! You can also simply sprinkle dirt in the model to represent your pollutants and the water will pick that up and carry it along as well. With older children you can calculate the amount of impervious surfaces in your school grounds and calculate the runoff. She suggests having children create plays to perform for parents and fellow students around these issues, or create and film public service announcements. Since apparently The Lorax is being made into a film now and will shortly be coming out, now is a good time to capitalize on student interest and review this classic book. It makes a great classroom play. I think I'm going to do Ecological Literacy as my theme for next year!!! We require Microscope Licenses (which have to be renewed every year) for a child to independently use the microscope. Edmund Scientific has the nicest selection of slides that I've found, with sturdy storage cases and helpful identification booklets for each set. They also sell plain glass slides and coverslips for those who want to make their own. The first step in getting your microscope license is a background lesson on microscopes and an explanation of the parts of the microscope. We have students complete a blank diagram by way of note taking. Then a different diagram is given to them to complete (using a word bank) as part 1 of the test. They are not allowed to look at their notes when they take it. The second step is to have a one-on-one lesson on removing a slide from the storage box, placing it on the stage, securing it with the stage clips, focusing, drawing the slide, removing and replacing it. We have special paper that the children draw their observations on. Part 2 of the test consists of the child choosing, focusing, sketching, and putting away a slide while the adult observes them. If they are successful and show that they can respect and care for the equipment, we issue a small paper license which goes in their work folders. It is a BIG DEAL because it is the only Test we give all year. I use the (now sadly out of print) book It's Fun to Know Why: Experiments with Things Around Us by Julius Schwartz and illustrated by Edwin Herron. Published by McGraw-Hill in 1952. The chapter "Glass -- A Window on the World" is perfect. However, you could easily make up your own text to explain. First, glass is made from sand. Second, glass is made in three ways: blown, pressed, and rolled. Third: mirrors have a silver backing to reflect light. Fourth: lenses and the discovery of Leewenhoek of a microscopic world in a drop of pond water. If you can find this old book, though, it's really wonderful. There are also chapters on Iron, Coal, Cement, Rubber, Wool, Salt, Bread, Soap, and Paper. Have the children look at plain beach sand on a piece of black construction paper with the hand lens to see the small clear grains that sparkle like glass. There may also be grains of other colors. Have the children look at themselves in mirrors. Plain mirrors with silver on the back are best (craft stores like Michael's or Edmund Scientific). Demonstrate that it is the curve that magnifies. Tear a small piece of newspaper and set it on a plate. Rub a dime-sized thin layer of Crisco over a section of the print. Put your finger in a glass of water and carefully drop a single drop of water onto the greased section. If the water lands and makes a bubble, it should magnify that area. Also try taking an ungreased piece of newspaper on a different plate and just pour a layer of water on top of the whole piece of paper. When the water is flat it will not magnify. This proves that it was the Curve and not the Water that did the magnifying. A mixed bag of lenses that can be combined in different ways is fun for exploration. Demonstration 4 comes in the part of the book that explains Leewenhoek's discoveries. While students are exploring with the lenses, I like to read a section from The Evolution of Calpurnia Tate , Newbery honor book from 2010. From pages 102 to 106, she describes her experience in 1899 of looking through her grandfather's microscope and seeing the world of invisible creatures in the pond water. After hearing about Calpurnia's experience with the old bronze microscope, it is good to move into a discussion of the parts of the microscope. Instead of using a reflector to capture and focus sunlight, we plug the microscope in and the light source comes on. Some parts of the microscope are still the same, like the focus knob and the eye piece. We are doing lessons on the techniques of block beeswax crayons. 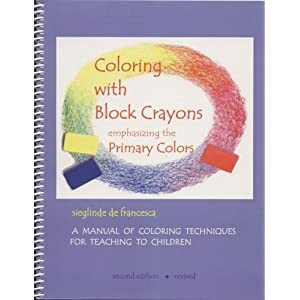 Sieglinde de Francesca doesn't recommend explicit lessons for the younger grades (1/2) and just suggests that you model an actual drawing and let the kids learn from your example. But if your children are coming to Waldorf older and you want to let them go "backwards" and have those early experiences, you can do specific lessons on techniques. I'm finding that the kids really benefit from it and are enjoying the material must more, instead of seeing it as babyish. I really recommend her book and DVD. The DVD is especially helpful if you like to see things done instead of just reading about it and trying to copy. The results that you can get from layering the colors are amazing and her DVD has some stunning examples! Sieglinde suggests if you have a classroom setting to set up three baskets, one for each color. I thought this was genius! Even though you still have to clean your crayons (a cotton cloth napkin and a few drops of Sweet Orange oil works great), you don't have to do it as much as when they're stored in a tin. The yellow especially can pick up colors from its neighbors. Go to A Small Green Footprint to get a set of the three primary colors for $3.55. If you're a classroom teacher, get as many sets as you need! This is cheaper and much more helpful than getting the big Stockmar tins. You can also get the crayons one at a time for $1.50 each if you only need one color. So handy. They tweeted it before they updated their website with a press release! It was driving me crazy, all morning, waiting for the announcement from Dallas. Here's the webcast if you want to watch it "live". You can in fact sign up to see the webcast live but we were too late. If you are a Twitter person you can follow them at @ALAyma. We are so excited to have an autographed copy of this year's Newbery winner! We had previously purchased it on a recommendation from the good folks at Politics and Prose, in Washington DC.